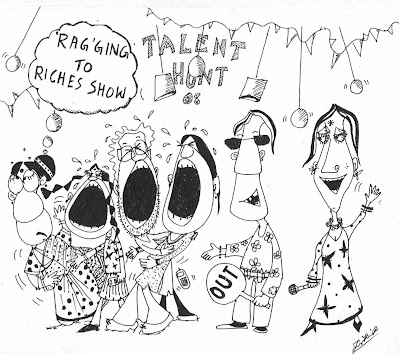 MAN IN PAINTING SEES THE WORLD: 'RAG'GING TO RICHES SHOWS ! ! 'RAG'GING TO RICHES SHOWS ! ! funny and tragic at the same time.. I wish there was some control over them. A wholly new aspect of the MIP coming forth for the last three posts. I m missing your poems though. So true and well depicted. so true,I am done with all these reality shows. Perfectly captured the show, the sobs, the satire is put on display so well!!! Hats off! Three in a row.. all of them really wonderful! The reality tv franchise has grown surreal. Too tragic and dramatic to be called reality. It must be renamed to UNreality tv. Heya... I loved your comment on Shruti's blog about drinking..
YOu dont drink coz i dont drink directly from Yamuna too!!!! A very strong point said..!!!! I love the faces... you're right... funny and tragic at the same time. ;)Did you write poetry back then? the characters depicted are eloquent with their expressions.. poignant and apt take on reality shows.. and the title is great too.. Your drawings capture the true sense of things with a good helping of humor!! I do love your puns MIP :). They are innately funny and you hit the nail on the head all the time. Heh... Yeah ragging.. seriously.. such a pain. Now for the viewers as well. Wonder when the age of reality shows will be passe... Or is it already? And that is why I never watch reality shows!!! hahaha... i HATE reality shows but this is funny albeit in a sad way! U said it all MIP. Superb! A true description of how reality shows are far from reality and more often than not a successful irritant! Ur works easily rank the league of an R.K. Laxman! but aren't we also creating a future generation of 'know nothings except singing and dancing'? painful scene, yet you need a shakehand! so so true, splly the 'Ragging' part !! come and collect ur award! When I started blogging, it was just an effort to practice "watch everything with out names and symbols"...Literature was the least possiblity..But very few came to watch the painting those days..still I was contented.. When movement take over, i cease to be a painting. and that is a tragedy because the sacredness of uniqueness of another evergreen forest in the brain will become civilized..
what shall I do mampi? She is going to beat Phelps! A deeper understanding of our self is necessary.. It is a good question..What will we call those strange way of arranging words.. Some fireworks done by neurons..when stimulated by certain patterns.. It is real and unreal..Unreal to a person to somebody who dosen't know this symbols.. unreal to somebody who have another set of conditioned patterns.. I tried to just stare at the world ..like somebody already dead. Even If i go back and correct the errors that i have typed just before...i become attatched , conscious and my capacity to "watch" IS GONE.. dESIRE CREEPS IN..and all the cravings of life will start to enter into that part of my brain called"the man in painting"
I hate these shows man..and my mom loves them..whatever.. I just draw,scan and post.. It is ragging most of the time bu the Rich and Famous..
i know you will give me more time..
That was one hilarious picture. Good job. haha! really funnny - true as well :) i see ur toons, all 3 of them.. simply amazing.... keep it up! !